"Dracula: Pages from a Virgin's Diary"
In this unforgettably daring re-envisioning of the most familiar vampire legend of all, director Guy Maddin ("The Saddest Music In the World") marries B&W silent horror-movie style with beautifully eerie ballet in a succulently cinematic, lustfully melodramatic adaptation that is at once wholly unique and uncommonly faithful to Bram Stoker's classic novel. Blessed with intense, wordless, brilliantly stylized performances that pulse with repressed Victorian sexuality, the film was born of a hugely successful production by the Royal Winnipeg Ballet. But in Maddin's extraordinary vision, the dance is merely one piece of a perfectly integrated narrative that uses strategic splashes of illustrative color and sound (beyond that of the haunting score), slow-motion and super-imposition, and heady symbolism to create a chilling, gorgeous, magnificently staged and inimitable artistic experience. Although a small handful of scenes drag slightly or seem somewhat arbitrary, it's impossible not to get lost in the film's powerfully ominous and seductive atmosphere. And this is due in no small part to the powerful acting-and-dancing cast. Tara Birtwhistle is enthralling and ethereal as the desired and doomed Lucy. CindyMarie Small is innocently alluring as maiden-in-distress Mina. David Maroni is portentous (in every sense of the word) as a primly misogynistic Dr. Van Helsing. 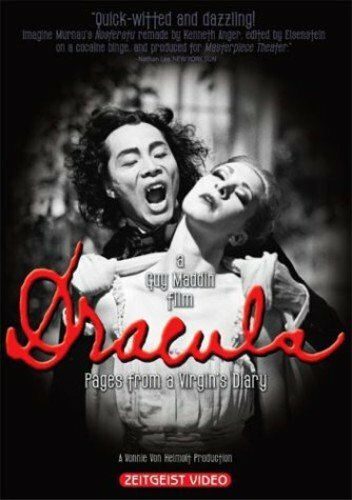 And Zhang Wei-Qiang, an ingeniously unprecedented choice for Dracula, is so piercing and mesmerizing that he rivals -- perhaps even bests -- every great actor who has ever played the role.